Out of a graduating class of 197, there were over 55 attendees. Some I have seen many times over the years. Others I haven't laid eyes on since I was 18. I've kept in touch with friends and also attended every reunion - held every 5 years or so - since graduation. All of us wore name tags. We are now old men and look much different than we did in 1961, with receding hairlines, thicker waists, wrinkles, failing eyesight and memories which are occasionally less reliable than in the past. 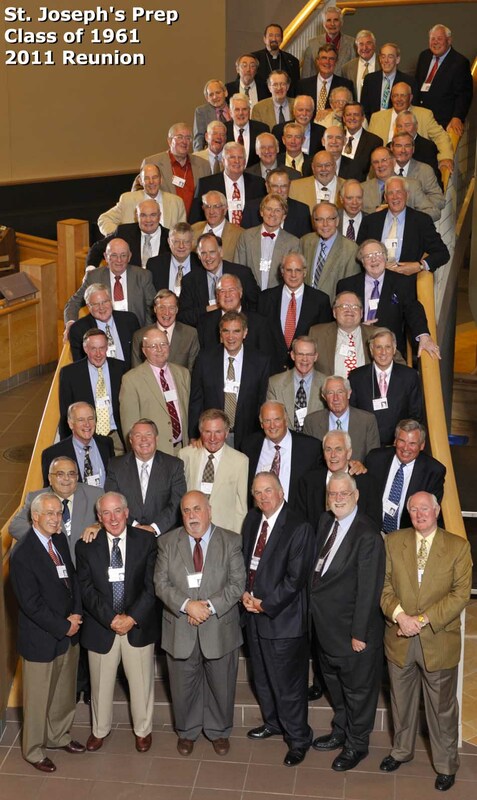 Over the years, 26 members of the Class of 1961 have died, including a few close friends. Requiescat in pace. All were mentioned individually and remembered in prayers offered at the Saturday afternoon Mass at which preceded the cocktail party and dinner at the school. The Mass was celebrated by one of my classmates, Fr. Len Martin, SJ. Father Joe Feeney SJ, one of my teachers, was concelebrant. Additional photos of Prep classmates from the reunion and our Philadelphia trip can be found here. 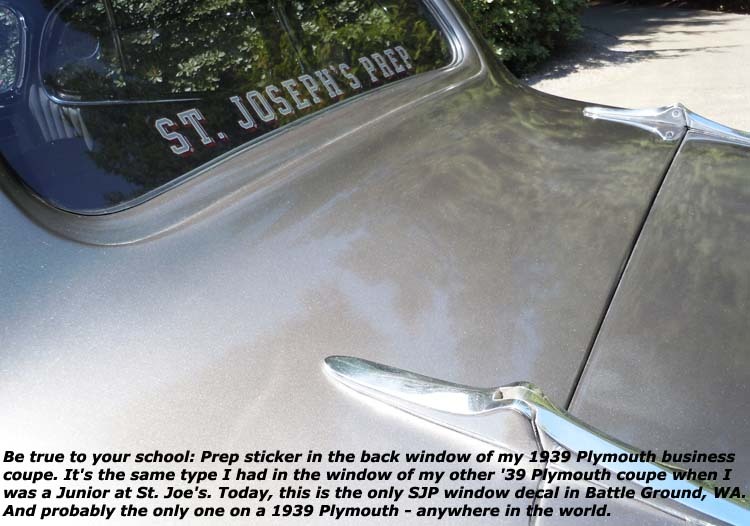 Saint Joseph's Preparatory School is a private Jesuit high school; it was founded in 1851. Located in a 'transition neighborhood' (bureaucrat-speak for a ghetto which everyone hopes is on the comeback trail), the present school site dates to the late 19th Century. It was once a working class, mostly Irish neighborhood; my maternal grandparents lived three blocks from the school in the early 1920s. By the time I enrolled at the Prep in the Fall of 1957, the neighborhood had become mostly poor and black. It wasn't considered safe for whites after sundown. Much of the school building where I spent my high school years burned down in a horrendous 8-alarm fire in 1966. The attached historic Gesu Church survived, thankfully. A new building was constructed next door - a conscious decision by the school to remain committed to the North Philadelphia urban community. While the physical plant may have changed, the tenets upon which the Prep was founded remain the same: to develop the minds, hearts, souls, and characters of young men. Because it is a Jesuit school, the principles of St. Ignatius of Loyola, the order's founder, are woven throughout its curriculum - a fierce loyalty to God, combined with a rigorous quest for knowledge and a drive to excel in all things. Prep education is classical in nature; when I attended, four years of Latin was mandatory for graduation. There was a dress code: jacket and tie required for all classes, except gym. Dressing up was good training for 1960s corporate life. SJP is known throughout the Delaware Valley as 'The Prep', despite the many other college-preparatory schools in the area with 'prep' in their names. When I graduated, tuition was $800 per year; for the 2011-12 school year, tuition is $18,500. Once a school which mixed well-to-do suburban Main Liners with working-class kids from all over Philadelphia, the necessary tuition increases at the Prep have caused a student body shift toward teens with upper-income parents. Although there is a tuition assistance program available. The demographics of the school are interesting. Of its alumni, 52% still live in the Philadelphia area. 82% live in the mid-Atlantic region of the U.S. Many of Philly's movers-n-shakers are Prep graduates. The current mayor is a Prepper. My class roster lists numerous professionals - physicians, lawyers, judges, etc. Only 0.55% live in what the school calls "The Northwest" (WA, OR, ID, MT, WY). In fact, more alumni live abroad than in that five-state designated wilderness where I now reside. When I attended the Prep, the majority of the school's students lived in Philly and used public transit to commute, including the PTC 15 trolley which ran along Girard Avenue - about a block from the school. Today, only 18% of pupils live within the city limits. 58% commute from the Philadelphia suburbs and a surprising 24% travel from New Jersey. The school now provides private bus service to outlying areas, although the old Route 15 trolley line is back in service. 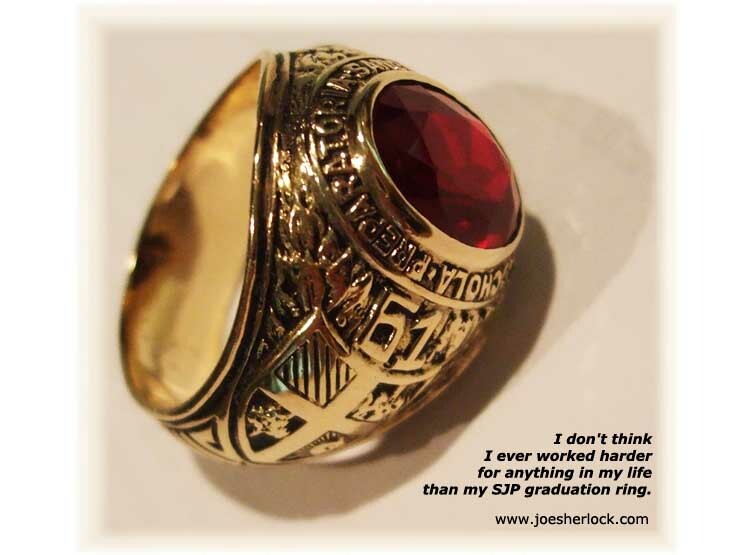 Of all the educational institutions I attended, St. Joe's Prep gets the credit as the one which defined my life and inspired me to achieve my goals. The nuns who taught me in Catholic grade school certainly did yeoman service, imparting regimen, discipline and rote learning. Villanova University provided me with a degree - a piece of paper which impressed prospective employers - but not much else. Even as an engineering student, I wasn't much of a booster, perhaps because the Prep had been so outstanding that the bar was set quite high. I've never bothered to attended any college reunions. So many of the good things in my life came as a result of the principles and education imparted by the Jebbies in high school: how to think things through, an assume-nothing/question-everything approach to seeking/verifying the truth, the continual search for greater knowledge and the drill of assessing the morality of every decision/action. All have served me well over the years. In my writing work, my mom gave me my start and inspiration; elementary school nuns taught me the mechanics of sentence structure. But I learned to craft creative, opinionated pieces and defend my positions with style while at the Prep. I was on the staff of The Chronicle, the school's literary magazine, and also wrote for it. In grade school, I was one of the top students in a classroom of 60+ kids. (My first grade class had 109 students in a single room. With one nun and no teaching assistant.) Good marks came easily for me. There were rigorous entrance requirements at the Prep; the school accepted only the cream of the elementary school crop. When I arrived at St. Joe's, I discovered that every one of my fellow freshman had been a top grade-school performer. I found myself in a fiercely competitive environment, surrounded by classmates who were smarter than me. Suddenly, I was pulling grades of 75 - or worse - rather than the 99s I was used to receiving from the nuns. I struggled just to keep up. It was my first encounter with adversity. But, being surrounded by smart people made me work harder and become a better student. Over time, my grades improved and I graduated with a respectable GPA. Later, when I arrived at Villanova's Engineering School, I found that most of my classmates already had courses in mechanical drafting, model making, wood shop and metalworking under their belts. The Prep's classical program offered no pre-Engineering courses. But my brain told me that I'd been in this situation before and I charged right through, even though I remained the worst welder in metal shop though the end of the term. Throughout my working career, I perceived every hurdle as just one more challenge and plowed through. When I proved that injection molding cycles could be substantially shortened without harming the quality of finished plastic parts (while working at Rohm & Haas), it was the culmination of a project undertaken because I didn't accept the conventional wisdom spouted by 'experts'. "Question everything," the Jesuits had taught me. When I penned an article about my cycle-reduction experiments for Plastics Technology magazine, it was easy to do because the Prep's Joseph Feeney, SJ taught me how to write interestingly and confidently with conviction. Later, as a manager, I was sometimes called upon to make last-minute, on-the-spot presentations before senior executives. I never hesitated. It was no different from translating Julius Caesar from Latin - on-the-fly, while standing in front of a class: "All Gaul is divided into three parts ..."
In the 1980s, when I was growing my own manufacturing business and had to set up training programs for new plant employees, it was no problem. I simply applied the 'transfer of knowledge' principles learned from my Prep teachers. During my four years at the St. Joe's, I made friends for life. All the groomsmen at my wedding were Preppers. 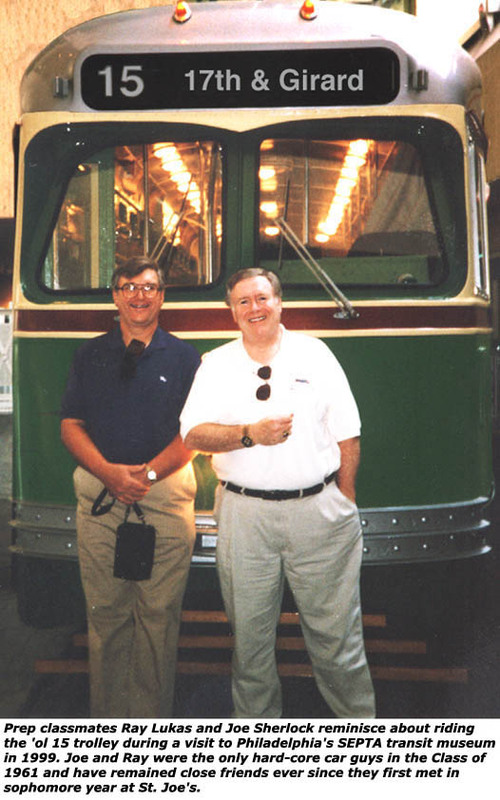 In 2002, fellow Prepper and transportation enthusiast Ray Lukas and I met up in Los Angeles for an eight-day, all-car/all-rail extravaganza. We traveled over 900 miles and visited every car, train, trolley and model train attraction in Southern California. Ray and I have always been car-crazy, I still have the program from the 1960 Philadelphia Auto Show which Ray, Marty Hayes and I attended in our Junior year at the Prep. Ray and I have remained life long friends, ever since we met in sophomore year St. Joe's. Even though we live on opposite sides of the country, we've met up on numerous occasions, including a Philadelphia visit in 1999, a meet-up to see and ride trains in Pennsylvania Dutch Country in 2000 and the Great California Adventure in 2002. Ray and I met again during this 2011 trip. I hope we have many more meetings in the future. It has been a long time since I sat in one of the ancient bolted-down wooden desks at the old Saint Joseph's Preparatory School. But the academic and ethical rigor infused in me while a student has guided my life. Thank God my parents chose to send me to the Prep. And thank God for the Jesuits.